This tall cherry almond cake is easier than it looks. Pretty enough for special occasions, it is made of two layers of almond cake with a layer of Maraschino cherry cake in the middle. The whipped white chocolate buttercream is light and airy — the perfect finish for this elegant layer cake. 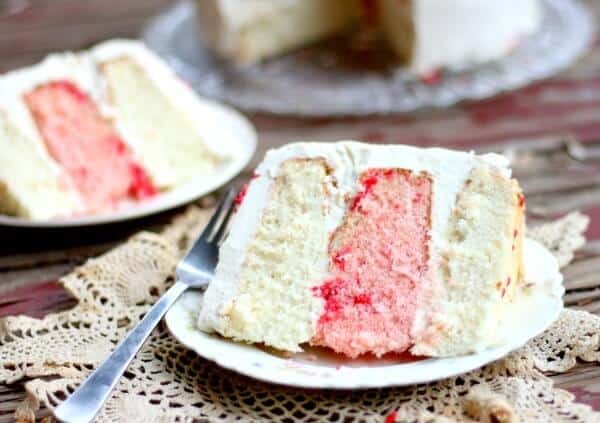 For this recipe you’ll need: cake, flour, baking soda, baking powder, salt, unsalted butter, sugar, vanilla, vanilla bean, almond extract, buttermilk, eggs, Maraschino cherries, confectioner’s sugar, heavy cream, white chocolate chips. 3 8-inch round cake pans, waxed paper. I love holidays of all kinds. There’s just something about the traditions and special recipes that go along with each holiday that makes me happy. I see holidays as a reminder to invest myself into my relationships. Valentine’s Day is a chance to let my family and friends know just how much I adore them. 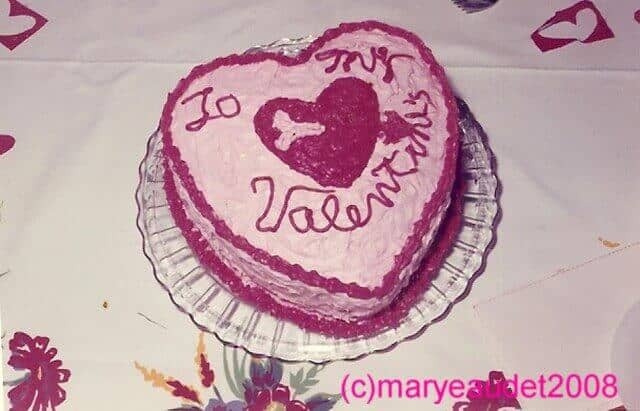 One of my favorite memories is making a heart shaped Valentine’s Day cake with my mom. She wasn’t much of a baker but for some reason she decided to make a cake for Valentine’s Day. I was probably three or four years old but I still think it’s the most beautiful Valentine’s Day cake I’ve ever seen. What do you think? I don’t remember how much of the cake I actually decorated but I do remember proudly serving that cake to my dad. My parents didn’t do much as far as Valentine’s Day when it came to their own relationship — at least not that I know of — but there was always a gorgeous card for me and a little gift from the Valentine’s Fairy. You see the Valentine’s Fairy would sneak into the house and leave a fun Valentine’s themed gift on my bed during dinner. I was an only child and my parents were in their 40s when I was born so I was doted upon. Not spoiled but definitely very loved. I’ve tried to pass that on to my kids — to somehow let them know how very loved they are without spoiling them. So far so good. They are pretty terrific. So, this cherry almond cake… It’s a 3-layer cake so it’s super tall and pretty. 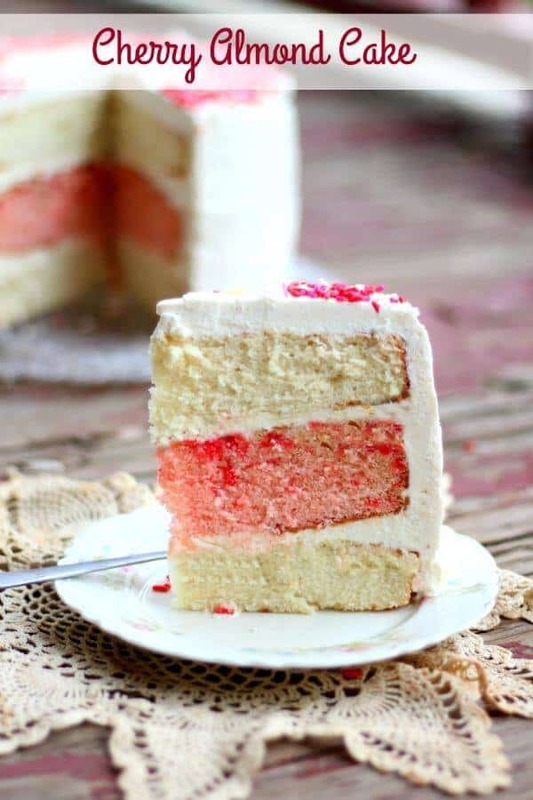 There are two layers of fluffy almond cake with a pretty pink layer of sweet Maraschino cherry cake in between them. 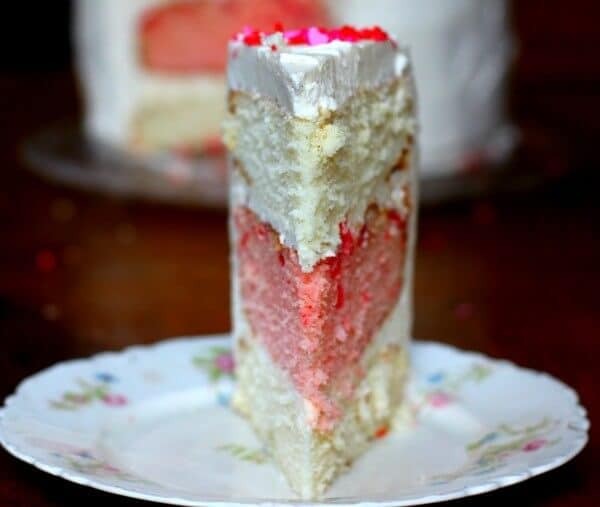 You can actually see vanilla bean in the almond layers and Maraschino cherry bits in the pink layer. It’s just pretty. But, like people, a pretty cake is no good at all if it’s not yummy on the inside. This one is. The layers are full of flavor, tender, and they are a good way to get that buttercream in your mouth. The buttercream. Oh my gosh, you better plan on extra because it’s going to be very hard not to lick your fingers until the white chocolate buttercream is all gone. It’s not heavy at all — the texture is similar to Swiss buttercream or the whipped frosting from the bakery. Very light and very, very rich, and perfect on this cherry almond cake. I am a fan of Bob’s Red Mill products. 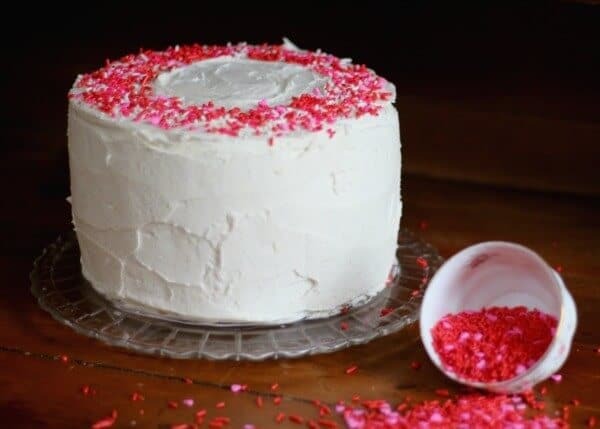 Cake flour is one of the reasons this cake is so light and velvety. There are all kinds of vanilla beans and they have different nuances. This packet has 4 different kinds of vanilla beans so you can experiment to find what you like best. 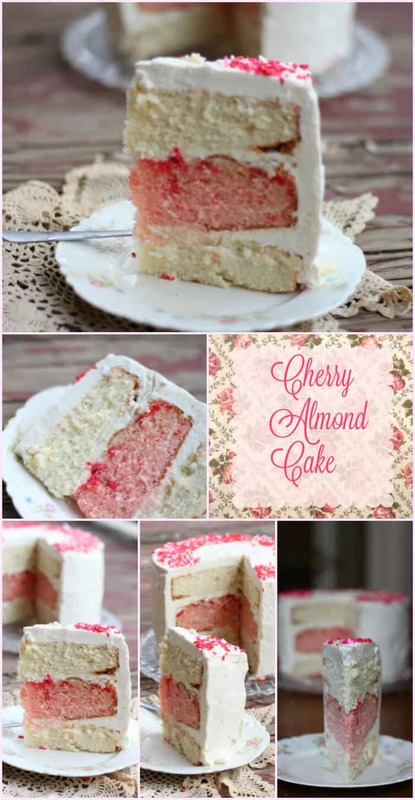 Here’s that cherry almond cake recipe! If you love this recipe please give it 5 stars! Beautiful 3 layer cake flavored with almond and Maraschino cherries and frosted with a thick layer of airy white chocolate buttercream. Grease 3 8-inch round cake pans. Cover bottoms with waxed paper and dust with flour. Sift together the flour, salt, baking powder and baking soda. Beat in vanilla, almond extract, and vanilla scrapings. Add dry ingredients alternately with the buttermilk, beating well after each addition. Add egg whites and beat at medium speed for two minutes. Add chopped Maraschino cherries to 1/3 of the batter. Divide the almond batter equally between 2 greased and wax paper lined 9-inch round pans. Add the Maraschino cherry batter to the third pan. Bake at 350 for 20 minutes, reduce heat to 325 and bake for 25 minutes more, or until the cake tests done. Cool in pans 10 minutes, then turn out and finish cooling on racks. Melt the white chocolate chips in the microwave, stirring every 30 seconds. Beat on high until well mixed. With mixer on high spoon the melted white chocolate into the buttercream, beating until it is light and airy. Use to fill and frost the cherry almond cake. Is it correct that the egg whites are not beaten separately before adding to the batter? I was about to try this recipe but was a bit concerned about whether the cake would rise sufficiently given the amount of flour and only one teaspoon each of baking powder and baking soda. This cake looks to die for! I really love almond sweets, such great flavor! Let me know what you think, Gwen! Thanks so much. Cherry and Almond what a great flavor combination. This would be a great dessert for Valentines, or any time. The presentation is beautiful. That is a TALL, gorgeous cake! LOVE the flavors too!